Cate: Please welcome Andrew E. Kaufman. Andrew, will you please share a short bio with us? Andrew: Thanks for having me, Cate. 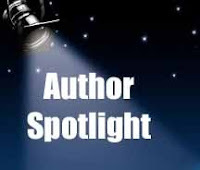 I'm former award-winning television journalist turned author of suspense thrillers. Not too much of a leap there, I suppose, considering what goes on in the world these days. I spent many years covering all the stories—including the O.J. Simpson trial in L.A.—which prove that life is in fact stranger than fiction! Of course, it all makes great grist for the mill while writing my novels. Cate: Wow, exciting. I'm sure some of your stories were indeed stranger than fiction. Tell us about your latest release and where it's available. 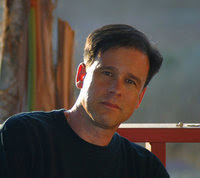 Andrew: While the Savage Sleeps takes place in the fictitious, all-American town of Faith, New Mexico. But its status as such quickly changes when strange things start happening. People are coming up missing, and for others, its far worse. I've also added an excerpt from the novel below. Cate: Love that title. Can you tell us why we're going to love your hero? Andrew: There are actually two of them. Cameron Dawson is a somewhat complex character. He's struggling to reconcile his troubled past, while at the same time, trying to figure out what's happening to his once-peaceful hometown. He's likeable guy and you can't help but feel sympathy for him because of the tragic circumstances he's had to overcome. Kyle Bancroft lives miles away in Albuquerque, where her life suddenly begins spinning wildly out of control. She's seeing, dreaming and hearing things she can't explain: an eerie hospital with locked doors, empty gurneys, and guttural screams. Her visions will eventually lead her to Faith, and right into Cameron's life where they'll race against time, trying to uncover a nameless, faceless enemy threatening to destroy the town. 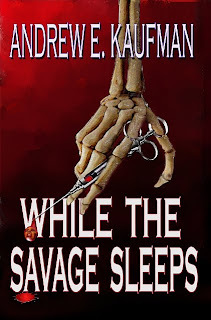 Andrew: While the Savage Sleeps is a thriller with a double-edged plot: Forensic suspense on one side, dark paranormal tension on the other. It's not a combination which you often see in fiction—sort of unlikely bedfellows, I suppose—however, it seems to work quite well. Two polar opposites that oddly enough, compliment one another. 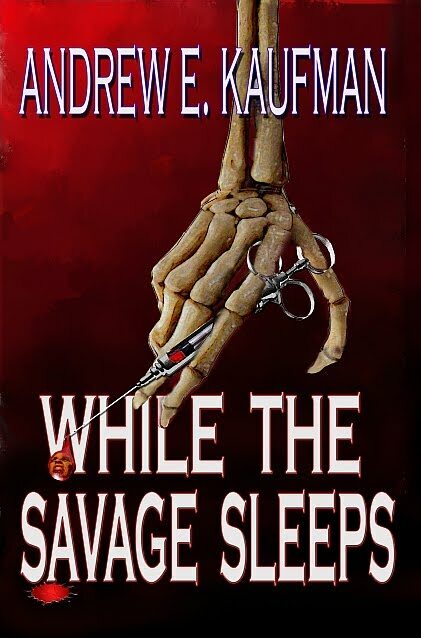 Andrew: Well, I was halfway through my second novel—a standalone, which is quite different from the first—when While the Savage Sleeps began taking off. With that, I began getting emails from readers asking me when the sequel was coming out. Trouble was, I hadn't planned on writing one. But since so many readers have identified with the characters and want to see more of them, I've had to change my course a bit. I'm still going to release the second novel, but once that's done, I'll get back to what will be part of The Savage Series. Savage Soul is already in development and will be my third novel. Andrew: Something most people don't know is that I've struggled with ADHD my whole life. It wasn't diagnosed until I was well into adulthood. Up to that point, I'd made many attempts at writing a novel but never got very far. However, after I was finally diagnosed and began taking medication, everything took a drastic turn for the better. Suddenly, the words seemed to flow onto the paper. It was quite amazing. I began hammering out chapter after chapter with very little effort, and a novel was born. I'm so grateful to have found out about it. Had I not, I wouldn't be here today talking to you about this book. Andrew: I try to write every day, and usually that ends up being at night and on the weekends—the only time I actually have available. For me, the key is to try and be in a good frame of mind while doing it. If I'm not, it usually reflects in my writing. So I often take breaks from writing every now and then when I know my mind won't let me be productive. Not long ones though—maybe a day or two—but just enough time to have a clear head and keep fresh and creative. Andrew: I always like to ask readers what makes them want to put down a book and not pick it up again. Of course, this is what we as authors fear the most, so hearing it directly from the readers gives me an idea about what to avoid. Cameron entered the autopsy room. Once again, the increasingly familiar smell of decomposing flesh, blood, and nonspecific cleaning agents flooded his senses. “We really have to stop meeting this way,” Gavin remarked with a hint of humor. Cameron returned a thin smile. His exhaustion prevented him from doing better. It had been a long trip. This was no picnic, either. Cameron nodded and crossed his arms, stealing a quick glance at Gavin as they moved toward the autopsy table. When they got there, Cameron stood and stared—wordlessly—at Felicity Champion’s lifeless, naked corpse. Long incisions, deep and bloody, crisscrossed her torso. One ran across her neck and chest, and another started between her breasts, then moved down, ending at her pubic bone—all stitched back together now, crudely, with what looked to be nothing more than common, household string. Cameron moved his gaze up toward her face and stopped there. With her mouth slightly ajar, eyes closed and relaxed, she looked so peaceful; all this in spite of being sliced by the medical examiner’s knife, ravaged by animals and by time, and worst of all, put here at the hands of a murderer. She shouldn’t have to leave the world this way: nobody should. Gavin was still talking. Cameron struggled for a moment, trying to find his way back to the present. “Dead bodies don’t bruise,” Cameron said, his eyes pensively drawn on the corpse. “Not really. I’m afraid a fiber is just a fiber until it’s examined and analyzed under a microscope. We’re sending them off to the lab. But the color does appear quite unusual, which could turn out to be a decent break for you. “Actually, there is.” Gavin said, an inkling of apprehension creeping into his voice. Cameron sensed the tension, then waited for what had caused it. Cate: Thanks so much for being my guest, Andrew! Best of luck to you.